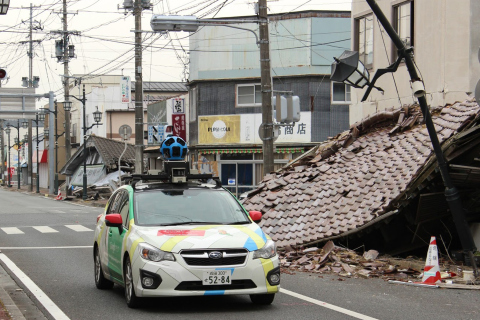 In this March, 2013 image released March 27, 2013, by Google, showing its camera-equipped vehicle as it moves through Namie town in Japan, a nuclear no-go zone where former residents have been unable to live since they fled from radioactive contamination from the Fukushima Dai-ichi nuclear power plant two years ago. (TOKYO) — Concrete rubble litters streets lined with shutte red shops and dark windows. A collapsed roof juts from the ground. A ship sits stranded on a stretch of dirt flattened when the tsunami roared across the coastline. There isn’t a person in sight. 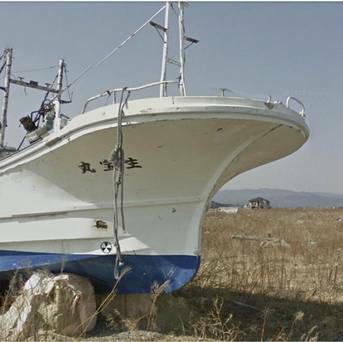 Google Street View is giving the world a rare glimpse into one of Japan’s eerie ghost towns, created when the March 2011 earthquake and tsunami sparked a nuclear disaster that has left the area uninhabitable. The technology pieces together digital images captured by Google’s fleet of camera-equipped vehicles and allows viewers to take virtual tours of locations around the world, including faraway spots like the South Pole and fantastic landscapes like the Grand Canyon. Now it is taking people inside Japan’s nuclear no-go zone, to the city of Namie, whose 21,000 residents have been unable to return to live since they fled the radiation spewing from the Fukushima Dai-ichi nuclear power plant two years ago. In this screenshot made from the Google Maps website provided Wednesday, March 27, 2013, by Google, showing stranded ships left as a testament to the power of the tsunami which hit the area, near a road in March, 2013, in Namie, Japan, a nuclear no-go zone where former residents have been unable to live since they fled from radioactive contamination from the Fukushima Dai-ichi nuclear power plant two years ago. Koto Naganuma, 32, who lost her home in the tsunami, said some people find it too painful to see the places that were so familiar yet are now so out of reach. She has only gone back once, a year ago, and for a few minutes. Namie Mayor Tamotsu Baba said memories came flooding back as he looked at the images shot by Google earlier this month. He spotted an area where an autumn festival used to be held and another of an elementary school that was once packed with schoolchildren. “Those of us in the older generation feel that we received this town from our forbearers, and we feel great pain that we cannot pass it down to our children,” he said in a post on his blog. Street View was started in 2007, and now provides images from more than 3,000 cities across 48 countries, as well as parts of the Arctic and Antarctica.